Weighted sleds were once only for American football linemen, but today they're present in every serious gym. Push it, pull it, load it up! Give max effort, burn max calories, get max results. The secret is out! 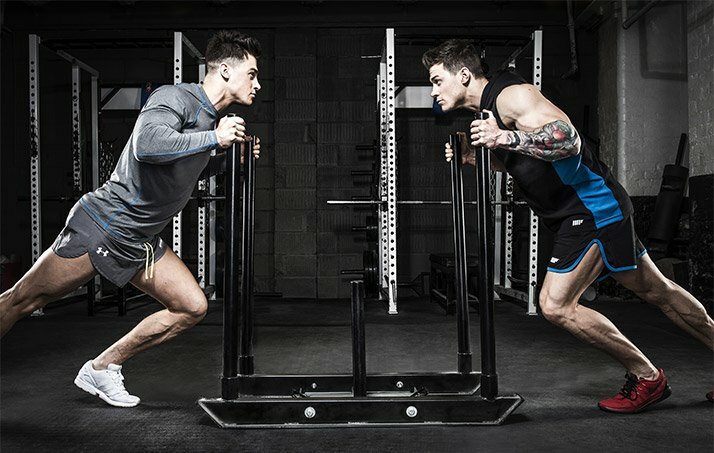 The push/pull dynamic of the weighted sled makes it one of the best all-round conditioning tools in the modern gym. It enhances both strength endurance and cardiovascular endurance like no other, while melting off fat like a frying pan. This unique piece of equipment helps athletes around the world to perform better. It's time for fitness models like us to get in on the fun, too! Push it, pull it—it doesn't really matter, because both movements drive conditioning to the edge. So let's do both! In the circuit below, you'll alternate pushing and pulling in 3-5 rounds of prowler death, increasing the weight each round. That's what's great about this apparatus: When you want to push or pull harder, all you have to do is throw on another plate! 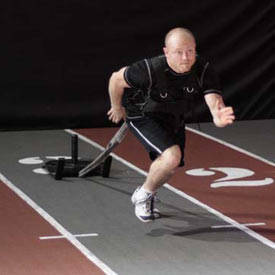 For the sled drag/pull, you can slap on a chest harness with a rope attachment and walk or run with the sled behind you, or you can flip it to work on your backpedal. You can also perform the pull from a stationary standing or seated position like we do in the video, gripping the rope and using a hand-over-hand pull to bring the sled to you. The longer the rope, the greater the burn! 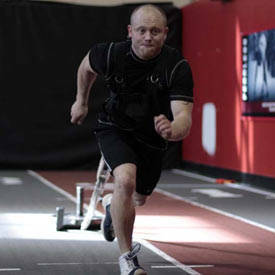 For a truly masochistic twist, you can wear a weighted vest while pulling or pushing a sled. It's akin to the British Marine Corps training, where they run while carrying a heavy pack and rifle for months at a time. Both strength and cardiovascular endurance dramatically go through the roof in just a few weeks' time. 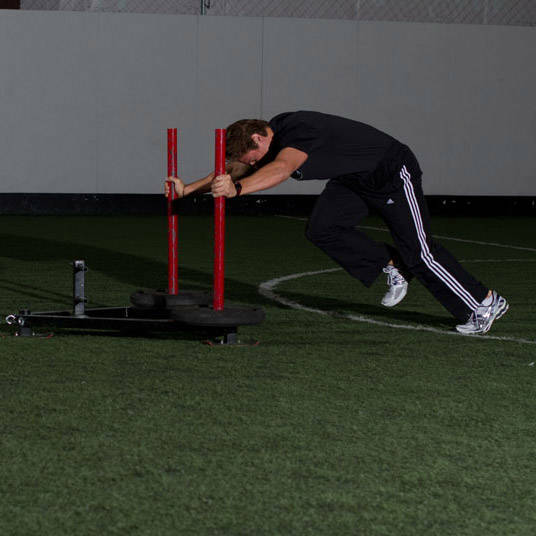 If your facility has two sleds, you may want to use both of them for this circuit in order to minimize time spent unclipping and futzing around between rounds. If you only have one, simply remove the rope attachment, turn around, grip the handles, lower your hips, and drive! Be sure to get your posture correct before you push, though. You want to drive the sled so that your spine is almost parallel to the ground. Most sleds offer a range of grips at different heights on the sled handles. Use them all! A higher, lower, or wider grip will change the resistance points in your posterior chain. Be sure to wear appropriate footwear; CrossFit-style cross-trainers or durable running shoes work best. If you're on real grass, you may want to wear cleats. This circuit breaks down into a two-stage circuit. 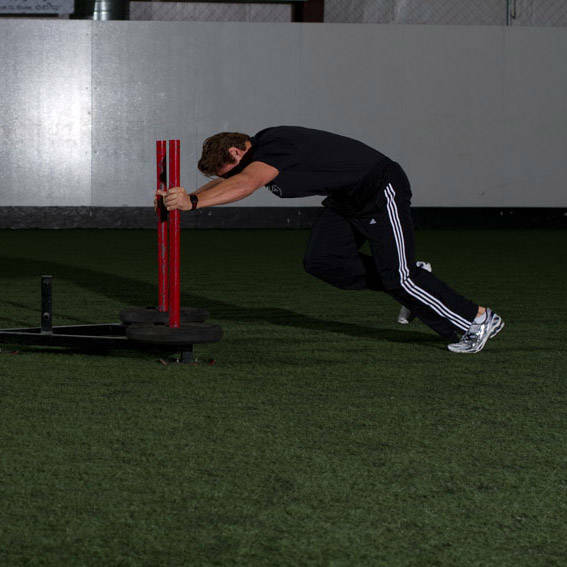 You'll drag or pull the sled for 20 meters at a full sprint, then push it back 20 meters, also at a full sprint. The distance can change to accomodate fitness levels, as can the rest period between. It works great with an "I go, you go" arrangement with a workout partner. Depending on your fitness level, aim to complete 3-5 circuits, adding weight each round. Only one factor is non-negotiable: Maximum effort is required! We highly recommend that you warm up before attempting this routine. This is high-intensity work, and you'll be going straight into the circuit with max effort. If you're warm and limber, you'll not only perform better, but you'll also help avoid injury. Wondering about weight? It'll take time for you to find the perfect amount. Honestly, there's no point loading a weight you can't push or pull with good technique, so load a weight that feels appropriate for your strength and capabilities. If it doesn't feel like it's working you to your max, just keep adding more plates! "It works great with an 'I go, you go' arrangement with a workout partner."